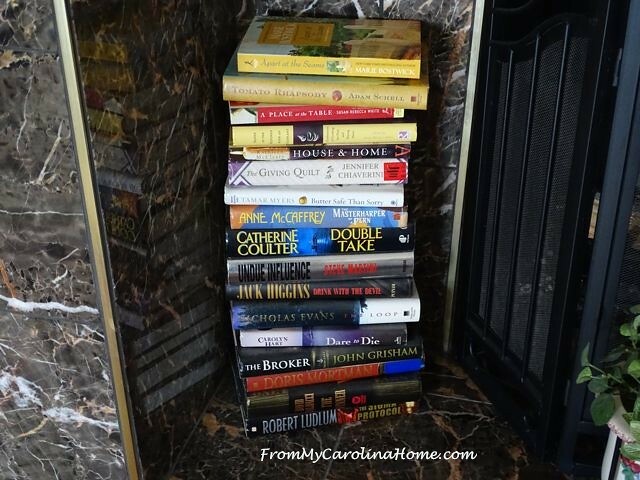 In the last two months, I have caught up with several good books from three good authors, and one in the not so much category. 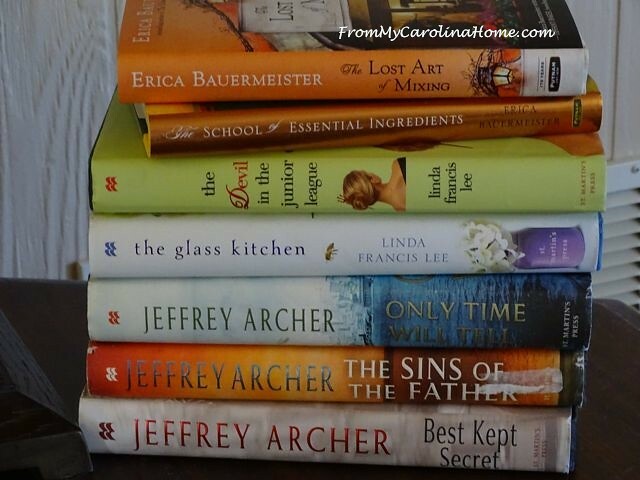 In each case, I picked up new titles, at least new to me, from authors I have enjoyed in the past. I have already put abbreviated reviews on Goodreads for a few of these, but I’d like to share them with you. First, Linda Francis Lee wrote a book I found years ago, and it is one of the funniest books I have ever read. It is called The Devil in the Junior League. A woman in the upper crust of Junior League society is abandoned by her husband taking all the money with him. The only way she can afford a lawyer is to hire the flashy, new money lawyer who moved into her neighborhood with the payment plan of getting his tacky, stiletto wearing, gum chewing, wife into the Junior League. What follows is a Pygmalion story that is just hilarious. This is truly one of the funniest books I have ever read. It made me laugh out loud on an airplane, and also while I was reading and trying to be quiet in a hospital ICU! Something that can make you laugh when you are worried is a treasure indeed. The story piles more laughs on page after page, as the situation just becomes more convoluted, and thus more comical. It is a light read, a great beach read, or perfect for anytime you want to escape into a Southern farce. When I saw the new book by Linda Francis Lee called The Glass Kitchen, I had to grab it up at the library sale. The book has a delightful premise, where a woman gets visions of foods that lead to information in her life, directions to go, how to find her sister, and more. Moving to New York after a disastrous divorce, she has to relearn how to let the visions in again, and in so doing, find her own way. I enjoyed the book, although I think it bogged down in the middle a bit with the predictable love affair, but managed to save itself in the conclusion. Like the other book by this author, the heroine is pushed around by the men in her life, and eventually comes into her own, finally accepting herself and standing up for what she wants. Another very enjoyable read, with a twist on the usual story. 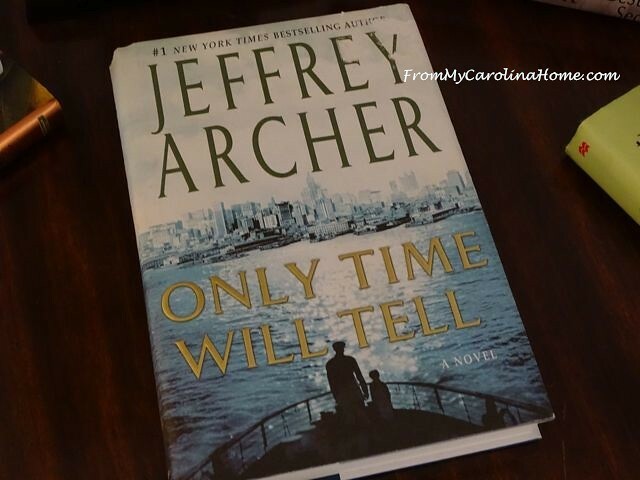 Another favorite author, Jeffrey Archer writes wonderful stories set in England. His novels are about family and political power, legal themes and epic tales. His series called the Clifton Chronicles is a well paced story in an easy reading style. In the first novel, Only Time Will Tell, Harry Clifton is introduced to the reader and grows up without knowing who he really is. His life in school, and the shaping of his character are explored with a cliffhanger ending that will make you race to get the next in the series. The Sins of the Father continues the story of Harry Clifton, beginning with his mistaken sentence for murder when he takes the identity of a dead shipmate. The tale proceeds in Archer’s trademark easy to read style, and compelling, page-turning storyline. Machinations of lawyers, and the second World War intervene to delay Harry’s progress to his goal of proving he is not the son of a British baron. Emma finds out the secret, and spends over a year trying to track down Harry and right some of the wrongs. The third novel in the series is Best Kept Secret. Harry and Emma’s son Sebastian grows up, and they adopt a sister for him. Giles, Emma’s brother, gets engaged and his fiancee is not what the family would want. Marrying Virginia anyway, Giles has to deal with the fallout, especially when his mother passes and leaves a new will. Virginia is not one to go down without a fight, and sets in motion a plan to exact revenge on those who she feels wronged her. I enjoyed this one on audio, listening in the car on my way to and from work, and while doing errands. It is much more interesting to do this than to listen to all the noise and commercials on the limited radio stations I can hear in these mountains. There are three more books in this series, and I’ll get to them soon. 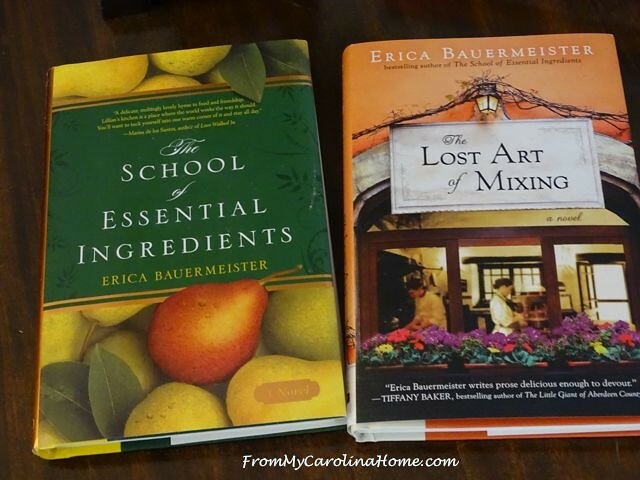 The third author is Erica Bauermeister who wrote The School of Essential Ingredients that I read last year. An uncommon story, this book is a very interesting character study. Lillian runs a cooking school on Monday nights, and the book explores the people in the class and how they interact with each other. The food seems to bring about feelings that in some cases have to be shared. It doesn’t have an earth-shattering plot, but is the kind of book to be read slowly and savoured. The descriptions of people, places, and particularly the food transport the reader to a magical slowing down of daily life, to live in the moment. The point is to derive pleasure in ordinary tasks, to trust yourself and be happy. This one is a keeper to be read again and again. I was happily surprised to find she had written a sequel to the story called The Lost Art of Mixing. This story is mostly a character study of several ordinary lives with trials and tribulations, ultimately savouring the day to day, the little joys, and small accomplishments that make up most of our lives. Some of the characters from the first book in the series have created new relationships, and Lillian finds herself in a situation that will require delicate handling and a great deal of thought. The exploration of each character in their view of the world, shaped by their experiences is a delightful journey. Sometimes, the least little thing will bring to the surface buried feelings and resentments, but can also bring a resolution to a conflict not acknowledged up to then. The disappointment was Diane Setterfield. While I enjoyed her Thirteenth Tale immensely, the next novel she published was a meh, not so much. In The Thirteenth Tale, a reclusive author, Vida Winter, decides to tell her true-life story to an unknown writer after decades of making up stories about herself. She is haunted by a request to ‘tell the truth’, along with some disturbing memories. She tells her story to Margaret Lea who has her own pain connected with a family secret. This secret is similar to the secret Ms. Winter has to reveal and impacts Margaret in a way she doesn’t expect, impacting her decision to do the biography. The story unfolds slowly, but builds on itself becoming more complex as it progresses. It completely drew me in as it went forward, making the book harder and harder to put down. The present day is woven into the tale as Margaret tries to verify some of the details, as when she finds the original house where Ms. Winter lived. There are several twists and turns, and you won’t see them coming. I am pretty good at figuring out how plots will progress, but this one surprised me more than once. Just when you think you know, there is something more that changes everything. Books play an important role in this novel, always a delightful discovery. The book is written from the point of view of Margaret, who is the daughter of a rare bookseller. Gardens and architecture provide interesting backdrops for the before and after aspects of the story. Given the success of that novel, you would think that a book billed as a “perfect ghost story, beautifully and irresistibly written” would be a good one. NOT! I found Bellman & Black to be a disappointing, flat, dull story. Spoiler alert, although you won’t care as you shouldn’t waste your time or money on this book. I see what Setterfield was going for, the arc of a stone thrown at a rook (a black bird) by the young protagonist is a forecast of the story of Bellman’s life as he reaches higher and higher for more wealth and more business, before his decline. As death comes to those around him, he seizes the opportunity to profit from it, yet it still claims him as it does all who live. The story, however, never takes off into the promised intrigue of the cover. Would you call selling mourning clothing as a “deadly, macabre business”? I wouldn’t. I didn’t care about the character, and never felt the story really come together. Now, I have to decide which book to read next out of the more than 200 on my To Be Read pile. Here are a few of my choices. Perhaps one from the stack above? See anything you’d like to read with me? How about these? Or this one? 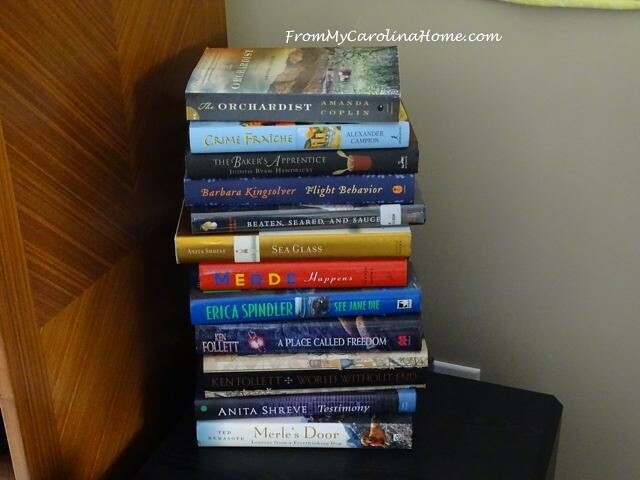 See anything you have read and can recommend? Most of these I got on recommendations from friends, although a few are authors I read again and again. Actually, a few of these I have already put in the donation pile, as part of the book clean-out that I promised DH. You know, once you’ve read three or four John Grishams, or Catherine Coulters, or Robert Ludlums, you’ve read them all. So, cleaning out, I gave those to Books for Good. Decisions, decisions, though, on what’s left! Anne McCaffrey? Jennifer Chiaverini? The latest Marie Bostwick? Anita Shreeve or P.D. James? A new author? I am reading The Luminaries, set in the 1860’s during the gold rush in N Z. Long book but worth the read. Thanks for all the great book recommendations! I just recently finished A Fall of Marigolds, about two women. One lived in 1911 and one lives in 2011 and both have been affected by tragedies that happened in New York City. A very good book! Can you ever go wrong with Anita Shreeve? Thanks for the reviews. Really good ones to check out……. Thanks for sharing your thoughts on these books. I read another of your recommendations, The Last Chinese Chef by Nicole Mones and really enjoyed it! Good Morning Carole! As you know, I no longer can read very many books, my memory problem just does not allow it. Yet, it makes me very happy and even excited to see and even remember you did post once before about books you had read. With this post I was all drawn in to your descriptive (oh the word I want is not coming)outline (is not the right word). But, it sure made me want to pick all of them up and read them. LOL. In reality, I know that would be a very big disasterous let down. Whenever we go to garage sales, second hand stores and such though I do find myself dreamingly holding books that I like to think I would have read at one time or would read now if my memory would only allow it. When a book really catches my whole attention, I go and discuss it thoroughly with Kevin. He knows the right questions to ask me while he is looking through the book (he is like you and has read many authors and many varieties of writing styles, which once upon a time many years ago before the automobile accident my Mother said I read all of the time. By the time we have gotten a short way or all the way to the end of the routine of questions, the book is usually sadly put back by my choice and my choice alone. It can make me very sad at times, but I am so darned blamed excited like a child riding a bike for the first time alone when I actually chose to buy a book and give it a try. It becomes a very special treasure to me and if I can actually follow along without having to reread the same page or even paragraph over 20 times in an hour….on to completely finishing it. Carole that is such a special accomplishment and we have a celebration! Oh look, I went and got carried away sharing with you again. I just feel like you understand and that we can share. I forgot that everyone gets to read my comments, but it does not bother me. So question…..between working, doing your lovely hand embroidery and ribbon embroidery, cooking and baking your scrumptious meals, taking the most clear and spectacular wildlife photographs, you and hubbies auto club events, your guild events, the gorgeous long arm quilting, awesome quilt pattern designing, devouring book reading of all sorts, your actual lovely pieced quilt tops that are then specially long arm quilted by you, your fantastic card making and am I forgetting anything besides breathing….but oh yeah the question…how in the heck can you find the time to read all of these novels? LOL. I know, I know….I am just teasing and trying to make you smile! I really do enjoy all that you share with us and you are a very talented and know how to handle the schedule of events kind of woman. Thank you for sharing and letting me babble on and on. Have a fantastic creative day Carole! The Orchardist is a great story! Well written! Thanks for sharing your reviews. Sadly, I don’t have anything to read right now, but appreciate your leads on good authors and titles. 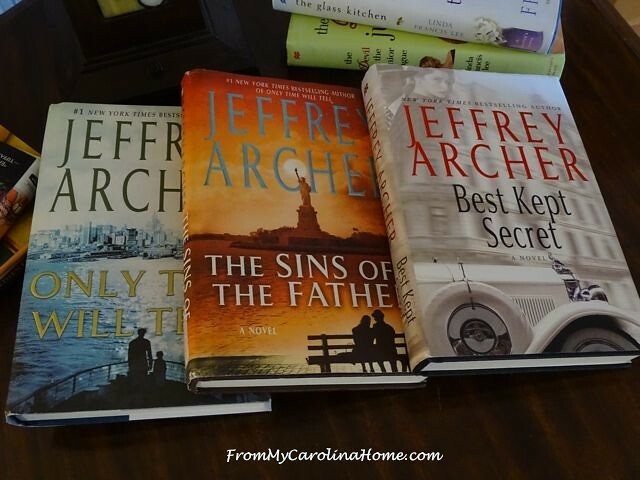 I too enjoy Jeffrey Archer, but it has been ages since I’ve read any of his books. Although there was a time when I had read everyone of his books. It now looks like he has quite a few out that I’ve never read. I’ll definitely have to get copies of his newer books, as well as some of your others that you recommended. 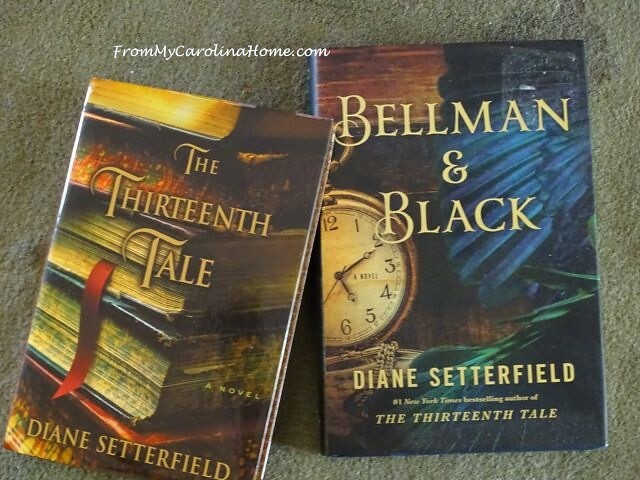 Thanks for the warning about Bellman and Black; I LOVED her book, The Thirteenth Tale, as well, so would have grabbed this one had I come across it. Now will know to leave it on a shelf. I just finished a book called The Condition by Jennifer Haigh which I liked very much, now am reading a Philippa Gregory novel (really enjoy her historical fiction). Too many books to read, too little time it seems! I enjoyed Eerica Bauermeister’s books. Flight Behaviour and The Baker’s Apprentice from your first pile are good reads too. Are you on Good Reads also? The latest J. A. Jance finally made it’s way through the library wait list to me, so that’s next up. I’ve been re-reading the Iris Johansen series about Eve Duncan because over the years, I’d missed quite a few. You can’t go wrong with Anne McCaffrey, ever, in my opinion, and Marie Bostwick is always a delightful and fast read. Normally, I stick with genres I like, such as science fiction or mystery, but last week I was reading a book for my job, one that I would never have picked off the shelf myself, and it was wonderful. It’s from 2009 – On the Corner of Bitter and Sweet. The main character is Chinese and it flips back and forth from the 40s during the war to the mid-80s, when he’s a widower. It isn’t the least confusing, and I really did enjoy it. Great characterization and all the ingredients for a satisfying read. Ah! Baker’s Apprentice & Sea Glass look promising to me. . . tho I can’t quite see who the authors are! Help! Of those yet to be read, I vote Jennifer Chiaverini – The Giving Quilt is good! 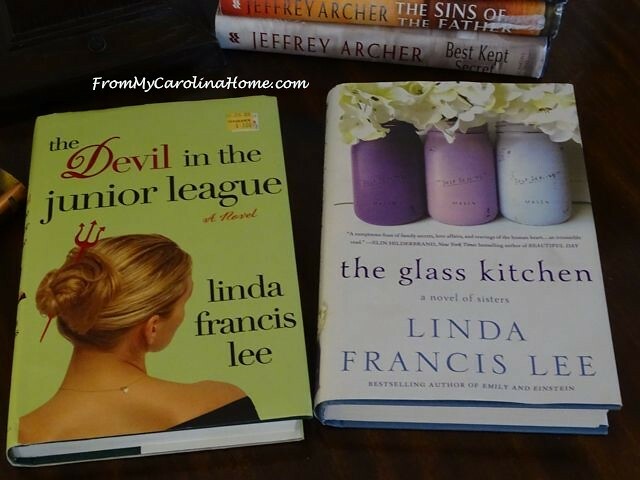 Devil in Jr. League & Thirteenth Tale are on my list now that you’ve mentioned them! Lost Art of Mixing sounds good too. . . Garage Sale season is nearly here so I now have a list to search for. Usually I “discover” an author’s book, only to learn it is #3 in a trilogy, so the hunt is on to get 1 & 2 – my summer crusade! Now I have the sequence written down for J. Archer’s, which makes me happy. Books are such good friends, I admire that you are culling & donating. I have a hard time with that! Enjoyed your reviews! I’m always searching for good books to listen to. I do a lot of cross stitching and listen to lots of Audiobooks. Philippa Gregory is always interesting to me. I saw in your pile, The Orchardist and Sea Glass which rang a bell for some reason. I’m in the middle of Galway Bay on Kindle and starting The Princes of Ireland on audio. Just finished Dreams of Joy by Lisa See. It was a continuation of Shanghai Girls. Enjoyed it very much. My favorites last year were All the Light We Can Not See. So beautifully written and listening to George R R Martin’s books was an enjoyable fantastical marathon (Game of Thrones). I always enjoy a good laugh so the Devil in Jr. League will be watched for. 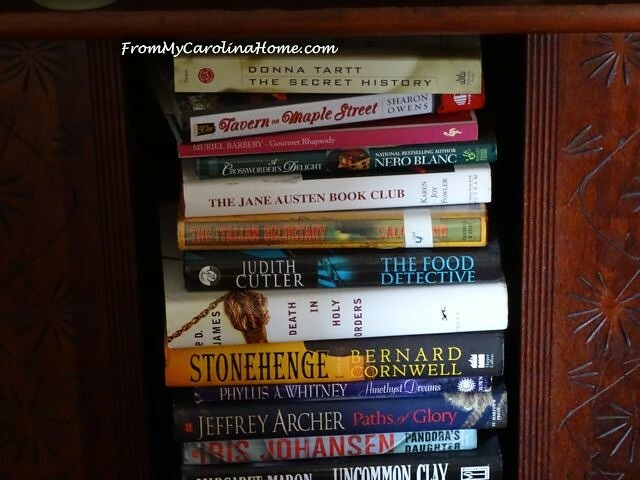 Janet Evanovich’s Stephanie Plum series does that for me and Jan Karon’s last Mitford series Come Rain or Come Shine was a delightful conclusion. I have friends that don’t like that series but I find it just simple and sweet and soothing. Well, all from me. I need to get Galway Bay finished by bookclub on Wed morning and it’s a hefty read. I Enjoy your blog so much. Thank you Carole for the great book reviews. I have a few of those in your pile on my kindle or reading list for the future. May I recommend the author Charles Martin. He is local to my area so I really love his books. And he does write about the south. His portrayal of the characters is believable and their lives are intricate and colorful. I just love his books. He is a Christian and also brings in that influence. My favorite is Wrapped in Rain. Be sure and tell us if you like them also. Thanks again! I do enjoy your blog always. Ooops! Left off another favorite author of mine….Davis Bunn. He has a new book, the Fragment I believe is the name. I love his books some of which are pure novels but many are historical ones which I thouroughly enjoy too. Thanks again! Barbara Kingsolver is always great! “Flight Behaviour” is well worth the read. Not a great cover, but a good story. Thanks for your book thoughts. I bookmarked this post to come back to once I”m on summer break! THanks Carole! I have an anti-recommendation – ‘Cuckoo’ by Julia Crouch. This book got a lot of great reviews when it first came out, so I was really looking forward to reading it… http://www.goodreads.com/book/show/10227033-cuckoo … but I found it all a bit far fetched and boring, and the ending made me cringe and left me very unsatisfied. Even years later, after I have forgotten most of the story, I still remember how bad I thought it was. Then again, I imagine I would feel the same way if I ever read ’50 Shades of Grey’, which most women love, apparently, so maybe it’s just a matter of personal preferences. I love how many books you have to choose from. I have always loved reading, but my reading habit has nearly come to a full stop since I’ve had kids. Hopefully when they are older it will return.